Discover whether the latest improvements add up to a rounded package. Houdini is already one of the most capable and versatile tools on the market, and the latest iteration refines the user experience further for faster workflow while consuming less memory. I've been a big fan of Houdini for the past few years. It has very much changed my life and how I approach my 3D art, all the way down to final production and dealing with changes. It’s quickly becoming known as one of the best pieces of 3D modelling software in the VFX industry, increasingly popular in both games and motion graphics. I've been working almost exclusively with Houdini for the past three years or so. What made me transition over to Houdini was how much more flexible my workflow became. Houdini is a node-based program, meaning that each action you do is represented with a node. These nodes are functions or tools that can be stringed together to form node trees that will perform various actions. Examples can be extruding surfaces, bevelling corners or deforming geometry – but really it can be anything. Of course, Houdini still isn’t for everyone and the learning curve is quite steep. Thankfully SideFX has a free Apprentice version available for learning purposes, so you don’t have to pay rental of $199 per year or buy Houdini FX for $4,495 and then decide that it’s not for you. Houdini works in similar ways to other 3D programs. In the end the same principles apply regardless of what tool you use, but what makes Houdini stand out from the crowd is how non-destructive (aka procedural) it is. If you are a Nuke or Fusion user you already know what I’m talking about. 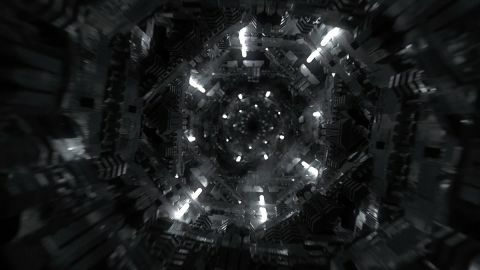 I like to compare the Houdini workflow to time travel; every action you do is represented in the node tree and you can at any time go back in ‘time’ and change the parameters of anything done previously, or you can branch the tree and create an alternative version of any given design you’re working on. You can then access data from other branches and create highly complex and sophisticated systems. In Cinema 4D for example you would take an object, extrude a couple of polygons, add bevels, add UVs and so on. But if you wanted to change the object, it would in many cases require that you go back to step one and redo the process in a linear fashion. In Houdini on the other hand you build pipelines for a set of actions and each operation is represented by nodes. You can go back at any point in time and change the parameters of anything in the history of the event, including the source object. This is the core principle of Houdini and why it has had such success in the VFX industry. This also makes Houdini great for dealing with feedback from clients, as you very rarely have to start over from scratch when changes get thrown your way. Also, it’s great because once you have built a function or tool that you like, you can package it up into an asset so that you can use it again in other projects or be distributed to other people on your team. These can also be used together with the Houdini Engine inside of other 3D programs as well, basically letting you run your Houdini asset as a plugin inside of your current 3D program, such as Cinema 4D, Maya, Unreal, Unity and so on. Very powerful stuff. This being said, this flexibility comes at a price. There are so many ways of achieving what you want in Houdini that it can be very easy to get lost in the system and lose track of what’s truly important to the design of what you’re building. Also, it generally takes a lot more time to build stuff, because many of the tools are much more granular – so in some cases it’s just easier to use a more traditional 3D package. So, would I recommend Houdini? Yes and no, it depends. It’s a big time commitment making the switch over to Houdini. For me, the way I used Cinema 4D in the past was not really the way the tool was intended to be used. Cinema has a lot of high-level tools that gives you a result quickly, but it’s lacking the flexibility I required. I found myself working against the program very often, building small Python scripts and stuff to work around some of the limitations there. So for me, coming to Houdini was like a dream. Information can be stored anywhere onto polygons’ points or vertices and used to drive anything that you like. It’s like playing God, and it’s really inspiring to think of new ways of manipulating data to make interesting creations. I know a lot of incredible designers that use Cinema 4D (or other programs for that matter) and their current tools do exactly what they need. If this is you, then stick with your current tool. It depends on how you approach problems. When faced with a task, ask yourself where you mind goes. Do you start by thinking of the end visual, and you can’t wait to get it done quickly by whatever means necessary? Or, do you have a more technical approach to design where you want to automate parts of the process, even if that means it might take a longer time upfront, but leaves you with reusable assets and a workflow that can adapt to changes? Or maybe you’re an FX artist, in which case this is not even worth discussing: you have to use Houdini. Consider this a love letter from me to the team at SideFX for offering one of the most capable and versatile tools on the market. This article was originally published in issue 231 of 3D World, the world's best-selling magazine for CG artists – packed with expert tutorials, inspiration and reviews. Buy issue 231 here or subscribe to 3D World here.